Includes free updates and upgrades. Valid for use on 1 PC. If you need to install on more than 1 PC you can buy more licenses. Free e-mail, telephone or remote support. Netkiosk Standard detailed configuration instructions. On first install just press enter to access admin panel. No username or password needed. 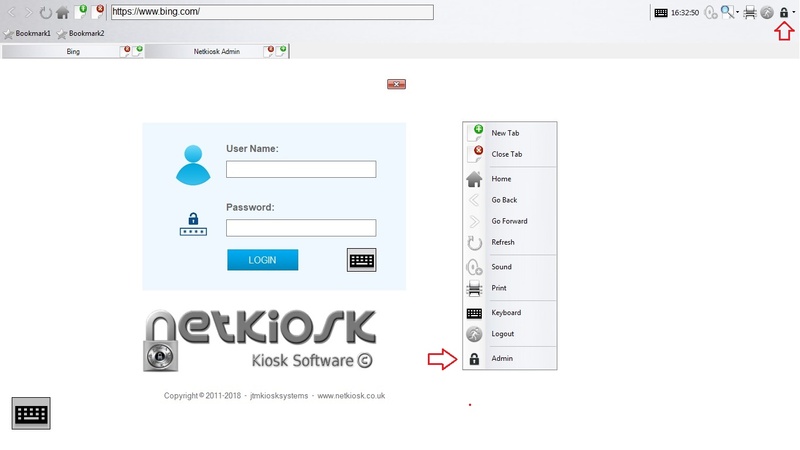 From the Admin Panel Tab you can instantly close Netkiosk and unlock the PC. No PC restart or user log off needed. The extra Log of user, Restart PC, and Shut down PC are helper quick short cuts. Add your own username and password. Enable or disable the Tab key. 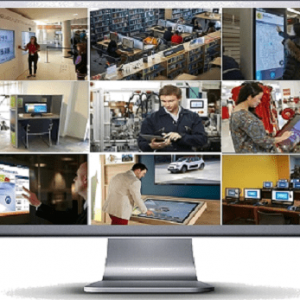 Automatically start the Netkiosk watcher program. The watcher program will restart Netkiosk in case of an unexpected crash. Restore all settings to default. 1. You can access all the security options using Netkiosk Advanced Configuration. You will find a shortcut to NetkioskAdvancedConfiguration on the Windows desktop. Or you can find it in the installation folder. Netkiosk Advanced Configuration can only be opened with admin rights. 1. Enter your home page in the text box next to option 1. 2. You can enable the white list under option 2. 5. Turn the idle time timer on or off. See below for the idle time timer instructions. Netkiosk Standard white list configuration. 1. You can add up to 40 website names (domains) to allow. 2. Enter the domain name only. Do not enter http:// or www or .com etc. 3. Netkiosk uses domain white listing which means you do not need to enter the full website address. 5. Do not enter anything like .com etc or the white list will not work properly. Websites are often redirected to country domains or different sub domain which makes content filtering very tricky. This is why Netkiosk only looks at the main domain name for the white list. If your domain has a Facebook or Twitter or Instagram or another sub-page then make sure to add these to the white list. On sites like Facebook and Twitter not always the Full domain is listed due to the character length and other restrictions. These sites then often abbreviate your domain. We have added a few samples which, of course you can remove to add your own website domain, and others. Netkiosk Standard idle time timer. 1. You can set the idle time from 1 to 60 minutes. If after x time a user leaves the PC without logging out, or the PC is idle for x minutes a Netkiosk screen will pop up. 3. A user has the option to click cancel. The user can then continue to use Netkiosk. 4. You can change the reset text to your own text. You can also change the idle time settings. You can instantly switch from tabbed browser to full screen display kiosk browser. Turn Netkiosk display info kiosk mode to ON. to hide all the menu bars. 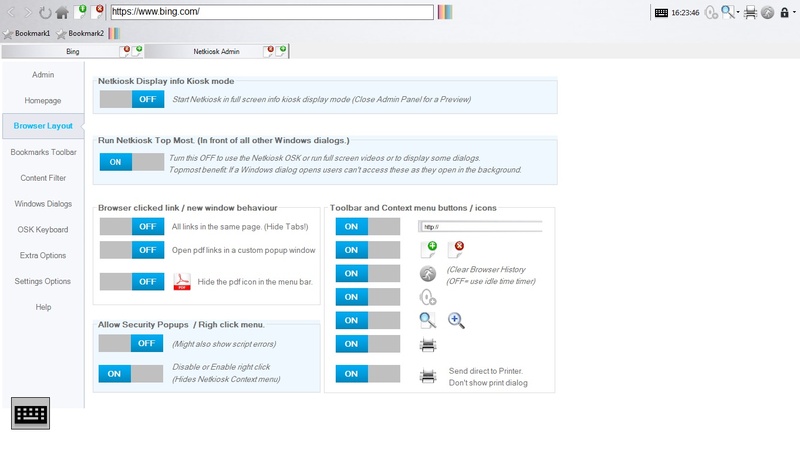 You can hide icons and configure Netkiosk to suit your needs. Browser clicked links allow you to open all pages in the same tab. The extra option (security popups) should normally not be changed. Start Netkiosk top most. Netkiosk will run in front of all other Windows and Windows dialogs. If a Windows dialog opens users can’t access these as they open in the background. 1. Netkiosk has a built-in custom bookmark tool bar. 2. You can show or hide the Netkiosk toolbar and give access to up to 10 fixed book marks. 3. Make sure you add the website name (domain) to the white list also if the white list is enabled. 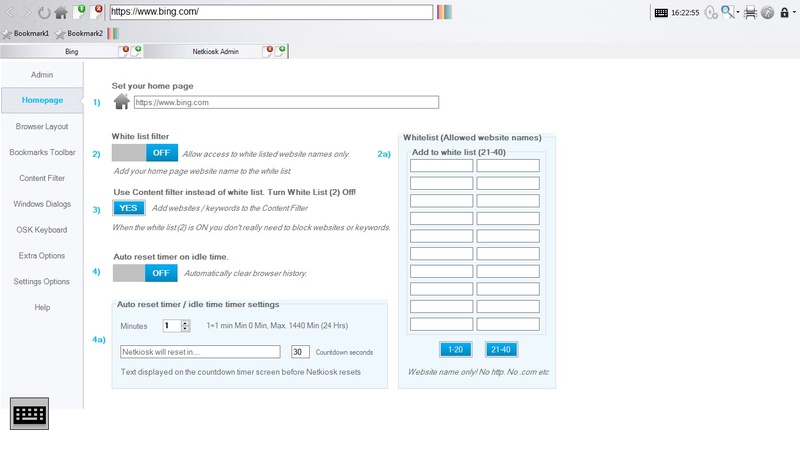 Besides the white list Netkiosk also has a custom content filter where you can block entire websites or keywords. A keyword blocks the entire website when the keyword is found on the web page. Be careful, as some websites contain keywords like Facebook that you might not want to block. If you want to block a website like facebook.com, you just enter Facebook in the domain list, on the Content Filter Tab. Again do not enter anything like http:// or www or .com etc. You only need to enter the main domain name of the website. 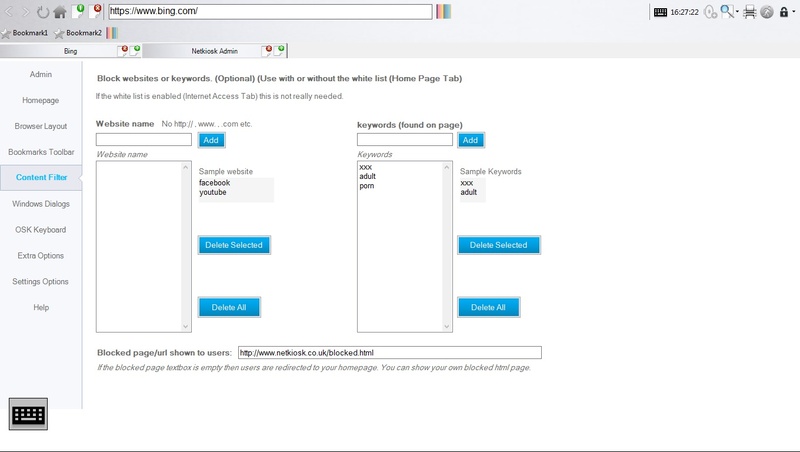 You can redirect the user to a custom blocked page when a keyword or website is visited that has been disallowed by the administrator. you Windows version is not in English “Save As” will be displayed in your own language. 3. Block all Windows dialog popups. These are non browser popup Windows. 1. In our latest Netkiosk Standard version you can enable “Auto Show” to be used with touch screens. 2. 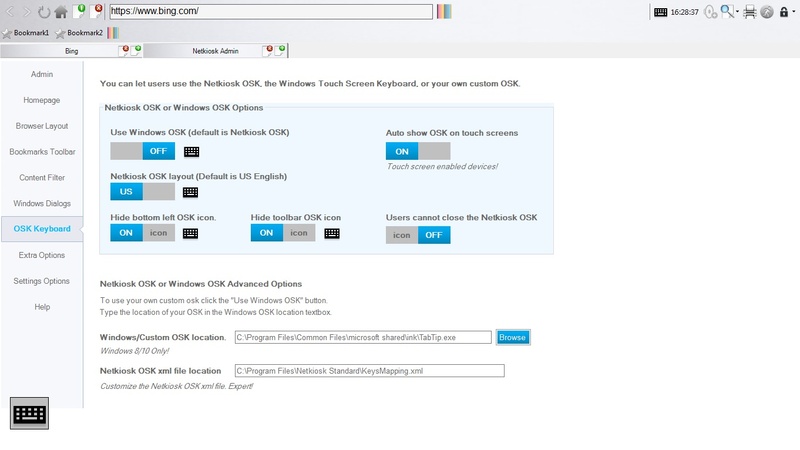 When a user types in a text box on a website the Netkiosk or Windows OSK will automatically show. 3. If you do not need to give access to the Netkiosk or Windows OSK you can simply hide the icons. 5. The xml file location is used by the Netkiosk OSK for the OSK layout. An expert can edit the xml file to change the layout. In some cases when a user logs our certain programs might remain open in the background. This is especially the case with Acrobat Reader. 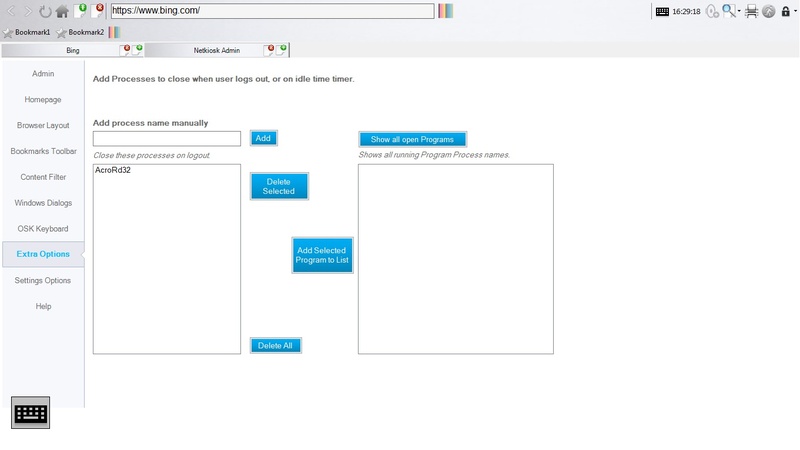 By adding the Acrobat Reader Program name (Process) Acrobat Reader will automatically close when the user logs out. You have multiple options to control the settings saving and loading. You can also store the settings on a remote server. When Netkiosk starts it will download your settings file from your server and load the settings automatically.